Chateau Adore is a winery operating under JW Vineyards, a family business known for its award winning premium wines. In 1995, Jimmie Wong founded JW Vineyards, which was also a supplier to leading wine making companies. However, as the market for bulk grapes and growers were increasingly in high demand and challenging, Jimmie began producing his own wine under Chateau Adore, targeting the growing China wine market. Chateau Adore’s brand of wines comes in a variety of tastes, from sweet to savory to spicy, and can be perfectly balanced with Asian cuisine. The winery’s top quality wines are made from grapes specifically grown in their vineyards in Sonoma County. They have been suppliers in Hong Kong, Guangzhou, Shanghai and Greater China, and is currently aiming to sell their wines locally in Northern California’s specialty markets and restaurants. The focus of this project was to create a simple, yet informative website to introduce the wide selection of wines offered. This had to be done in an innovative and engaging manner so that potential customers may easily navigate through the website to find what they are looking for. The Ready Artwork team was quick to construct a 3-page, mobile responsive website that was concise but visually appealing. The website consists of a “Home”, “About Us”, and an “Our Wines” page. 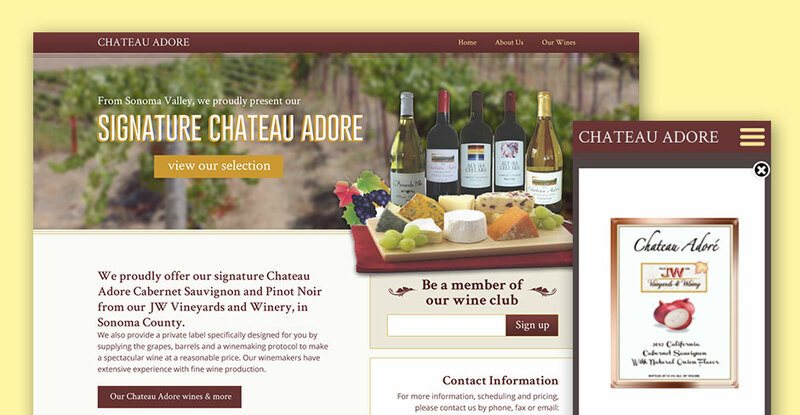 Ready Artwork included a section on the homepage to provide more background information on Chateau Adore’s tasting room. The design team incorporated an image gallery on the “Our Wines” page to showcase all the labels of wine offered. Visitors can conveniently browse through the array of wine selections in the featured wine gallery. Lastly, a newsletter subscription sign-up section was included for anyone interested in participating in the wine club.